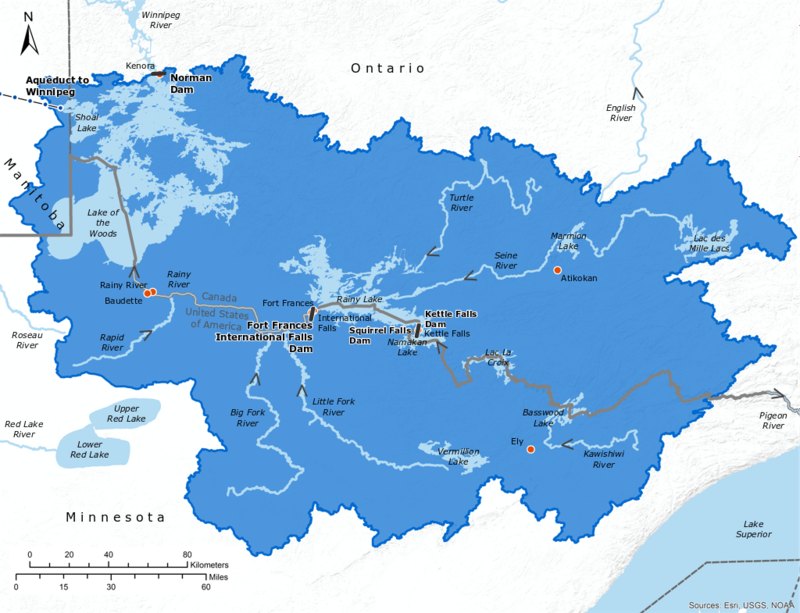 The International Rainy-Lake of the Woods Watershed Board (the Board) was created in January 2013, from an amalgamation of the International Rainy Lake Board of Control and the International Rainy River Water Pollution Board, with added water quality responsibilities for the broader Rainy-Lake of the Woods watershed. The Board was formed to assist with binational coordination of water quality efforts for the entire transboundary watershed and to ensure compliance with the Commission’s Order on the regulation of water levels on Rainy Lake and the Namakan Reservoir. The International Joint Commission’s (IJC) Rainy‐Lake of the Woods Watershed Board will be hosting two very different public meetings in early March, one focusing on a review of current basin conditions and forecasts, the other a workshop looking at the development of water quality objectives and alerts and perspectives on aquatic ecosystem health. The International Rainy-Lake of the Woods Watershed Board invites you to attend a meeting of its Water Levels Committee, in International Falls (MN) and a meeting of the entire Board, in Kenora (ON). During the month of April the Water Levels Committee of the International Rainy-Lake of the Woods Watershed Board directed the operators of the international dam on the Rainy River at Fort Frances-International Falls to target the lowest 10 cm (4 in) of the Rule Curve band on Rainy Lake. Based on input from various stakeholders received and a review on 20 March 2018 of current basin conditions and forecasts, the Water Levels Committee of the International Rainy-Lake of the Woods Watershed Board have directed dam operators to adjust the April water level target range for Rainy Lake. The International Rainy-Lake of the Woods Watershed Board invites you to attend a presentation by the Board, meet Board members and staff, ask questions, and express concerns. This year, the Board will be holding a public meeting in Tower, Minnesota. See details below.